This spring, we undertook a radical transformation on our homestead. After seven years of raising animals for meat (chicken, turkey, quail, duck, rabbit), and eggs (chicken, duck), and milk (goat) we have decided to go meatless. Not only did we go meatless in the fields, we also went meatless in the kitchen. This is the complete opposite of our idea of homesteading when we started in 2011. However, in the end, it was inevitable. Why was a meatless homestead inevitable for us? Mainly because of our age and our disposition. I’ll be 49 years old this spring and my wife is in her 50s. One of the reasons we started homesteading was for our health. “Get out, do some good honest farm work, lose weight, get healthy!” After seven years we both weigh 20-30 lbs more than when we got here. That’s not terrible, I guess. But it’s also not good! For us, it turned out that spring planting of the small garden, driving a tractor around mowing, and feeding animals didn’t offset the effects of a standard American diet. Just because we live on a homestead doesn’t mean we can’t find our way to restaurants, fast food, or Walmart for steaks, ice cream, and mashed potatoes on a regular basis. Neither one of us is willing to enter the last “half” of our life burdened with obesity if we can do anything about it. Therefore, it was inevitable that we were going to have to do something about our food intake. We are also both very logical, pragmatic people who believe in science, so whatever we did was going to be researched. Every medical study we read linked meat, fat, oil, grease, sugar, and “processed” to heart disease, heart attack, diabetes, cholesterol, dementia, cancer, and obesity. The pattern started showing more and more that the closer a person gets to a whole-food plant-based diet the healthier they become based on blood metrics like cholesterol, blood sugar, blood pressure, etc. The closer a person gets to a whole-food plant-based diet the less they weigh, the less fat they carry, the easier it is on their joints, and the more mobile they stay throughout life. We also notice the people at Walmart on the motorized carts. Without judging why they are on the carts, it’s easy to observe that obesity is often either a cause or an effect of poor mobility. Not us! Since we will not accept the limitations, pain, discomfort, medications, and medical problems associated with poor health, in particular, obesity; and since we believe in science it became inevitable that we were going to move into a meatless lifestyle. This is true both for our homestead and for bodies. The final factor for me wasn’t the idea of dying at 56 like my father did. The tipping point was the realization that I’m probably NOT going to die at 56. I’m probably going to LIVE to be 78. That’s what every longevity survey I take tells me. And it’s what my doctor tells me. I’m already on the verge of obesity at 49. In 15 more years, I’ll be 100 pounds overweight. Not on my watch!! I’m not political either way. I see both sides’ arguments and I see the holes in both sides’ arguments. I’m not radical. Upon learning about my choice my friend asked me, “What, are you an animal lover now?” I said, “I know I love one animal… ME!” That’s all that matters. The rest is for everyone with strong feelings to debate. I’m not into the social aspects of my choice, just the personal. Vegetarian, Pescatarian, Lacto-Ovo Vegetarian, Vegan…. I honestly don’t care. White rice is a grain, but I don’t eat it. I eat whole-grain rice. If there’s some fish stock in the vegetable gumbo I don’t really mind. I’m not trying to push a lifestyle. I just want to describe it in case others find it of use. We came to the point of making this particular transition for our homestead based on a number of factors. The first was that our weight keeps climbing in spite of all efforts to the contrary. The second is that I trained a dog (that’s my job) for a fellow who lost 70 pounds in a short period of time, even though he was a morbidly-obese, sugar-addicted alcoholic, by just moving to a whole-food plant-based diet. He was thrilled with the choice and never would consider going back. He was too fat to exercise, and I’m generally too lazy to exercise. Finally, I did the research. I, personally, have never liked the news stories I see all the time that say things like, “According to a New Study eating bologna increases your risk of colon cancer by 18%.” I see these things all the time and I know that graduate students need theses and research grants need results. Most of these studies are studies of studies… don’t get me started… However, looking at the big picture, the long-term deep studies of health, the trend is as clear as the iceberg in front of the Titanic. Fat, meat, cholesterol, heart attack, death. Sugar, flour, butter, milk, eggs, bacon, obesity. Anyone left arguing against it is probably still smoking cigarettes and saying, “My father lived to be 80 and he smoked.” No point to argue with that. On the other side of the ledger are fruits, vegetables, whole grains, health. Mediterranean diet, Japanese diet, non-processed diet… these all point toward health and longer life. I asked what they had in common and it kept coming down to a whole-food vegetable base, with very little meat (mostly fish). I’m not a big fish eater and I don’t live by the sea. A little more research and it turns out that the fish isn’t required either. Decision made! If we aren’t going to eat them then why raise them? We don’t see farm animals as pets and don’t want to keep and feed animals for no reason. If we don’t think we should eat them then why should we raise more of them for others to eat? So the animals all went to the auction. The rabbits, chickens, ducks, quail, and Nigerian Milk goats. Now the homestead is a lot quieter and the nine acres of fields around our house are empty. The big pain of raising field livestock (goats in particular) is that they eat everything and can trample what they don’t eat. That meant that our garden-growing space was limited to the area near the house (which is mostly shaded). I couldn’t plant an orchard without fencing the goats away from it. Now I can!! Now we have to re-evaluate how we can use our homestead space. The first item for me is an orchard. Particularly figs. I love figs. Also jujubes (red dates). These are small, easy-to-grow fruit trees that are extremely tolerant of different soils and climates. Our area is a great place to grow peaches, pears, blackberries, and blueberries. The soil is very conducive to those type fruits. My wife loves persimmons, which are also easy to grow in this area. 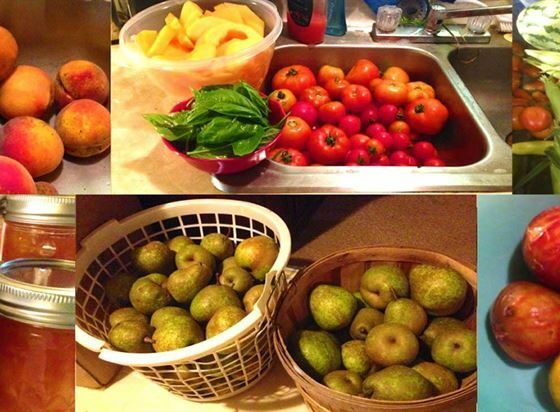 All of these fruits are either hard to find at the store, expensive, or, when you do find them, they aren’t really ripe. I can find some types of apples that are good at the grocery store, and sometimes the pears are ripe. Other than that I have a real hard time finding premium fruit inexpensively. It will be great to have our own source. This area is also great for pecans. Pecans aren’t as interesting to me as cashews or almonds, but they do grow here without any issue. There is a full-commercial pecan grove just half a mile away. We are also going to go out on a limb to try to grow mission almonds. We are a little north of where they work best, but if I get one crop every three years I’ll be happy with the effort. We would love to grow olives and avocados, and we might try, but it probably won’t work out. The thing I love about mature trees is that they are drought tolerant. My research into how climate change will affect my particular micro-climate over the coming decades points toward more of a dry-season/wet-season model. Our homestead is in East Texas where the weather is affected by winds from the west (California), from the south (Mexico), the jet stream, and moisture from the Gulf of Mexico. So our micro-climate will not become drier or wetter. It will become slightly hotter and the rain will come more torrentially and sporadically. The same amount of rain but in bigger bursts spread farther apart. That means sporadic drought and occasional floods. Mature trees are capable of handling such changes; the harvests might vary, but the trees will survive. The other change will be moving toward more leafy, green vegetables, particularly in the fall. Broccoli, in particular, will be important. Cauliflower, cabbages, and Brussels sprouts are also possible, although I’m not particularly fond of them. I know squash grows here well as do sweet potatoes. I think eggplant will be a good idea as well. When we were eating mainly meat, we only grew green beans and salad vegetables. Now we will be moving into more staple vegetables that can be the basis of a meal. We can also grow vast quantities of beans. I made the transition to a meatless-eating lifestyle by simply removing the meat. I also removed the cheese and milk. How? Easy! I go online and order a Domino’s pizza with extra sauce, lots of vegetables, and no meat or cheese. It’s still great. It’s not “the same.” But I have no interest in trying to pretend that I still eat meat and cheese. I don’t. So why fake it? I don’t need soy hot dogs that taste like warm mush. I can simply eat something else. I quit smoking 10 years ago. I don’t try to pretend I still smoke. I don’t walk around with a fake cigarette in my mouth. I gave it up and moved on. It was bad for me, why mourn it? I feel the same way about meat and cheese. There’s no need to mourn it. If someone says “do you want a burger” I consider it the same as someone saying “do you want a cigarette?” “No thanks.” If I believe it is going to kill me or make me fat, in pain, on pills, etc. then it’s not even a close decision. This makes life easy for me. Gumbo! I got a can of gumbo base at Walmart and added lots of vegetables (onion, celery, carrots, and eggplant). I sweetened it up with chopped dates, and then put it over a wild- and brown-rice mixture. It was great. Yes, the canned gumbo-base had some flour in it and some fish stock. So what? Like I said, this is not a religion for me. It’s a choice. Here’s how not to hate oatmeal. Make half a bowl of oatmeal, the instant kind is fine, then fill the rest of the bowl up with nuts and fresh and or dried fruit. Finally add some Blue Agave Amber Raw (it’s a low-glycemic sweetener, again from Walmart). The oatmeal is the minor part of the meal. It’s really a bowl of fruit and nuts with some oatmeal in it. It changes the entire dynamic of eating oatmeal. When people think of “vegetarian” or “vegan diets,” they think of having to make everything from scratch and never eating “normal” food. Much of Mexican food is vegetarian. Rice, beans, flour tortillas, chips, salsa, guacamole, black beans. If you eat cheese, then pizza with vegetables, mushrooms, etc. is exactly the same as a “regular” pizza. What else? Italian? Eggplant Parm! Spaghetti with sauce minus the meatballs. It’s actually pretty easy. When I remember that almost the entire sub-continent of India is vegetarian as well as most Buddhists, then I realize there’s plenty to eat. Our research showed that it is imperative to take in ground flaxseed and vitamin B-12 if my wife and I don’t eat meat. This will keep our Omega 6 to Omega 12 ratio below 10 (which is very important for both heart health and dementia risks). A standard American diet puts people at 12-15, a straight vegan diet can put people above 20. That’s not good. So ground flax (a powder that can go on or in anything) and B-12 are important supplements that we will need. Plus everyone needs more vitamin D and calcium. When my wife and I decided to move out to our homestead we did so in order to make exactly our own choices. Even though they all have land, none of our neighbors have solar. We do. Most of our neighbors don’t garden, even though they live in the country. We do. We came out here in order to have the land and space we need to create a life that fits our lifestyle and our future. We don’t mind being a little bit different. Luckily the land is very flexible. It can go from feeding goats to growing eggplants or peaches without missing a beat. The transition will take a while. Trees don’t mature in a year, particularly nut trees or olives. But we aren’t planning on going anywhere. We came out here to have a fun, interesting, productive life TOGETHER for the rest of our lives. At this age, we looked at the next 20 years and said, “In order for our lives to continue to be productive and healthy we need to make a change.” So we did. No more roosters crowing in the morning. No more goats calling us from the field. Life is so much quieter. Time to start putting in irrigation and root drainage for the orchard instead. Great article Anthony, thanks! We’ve been “vegan+” (WFPB) for about a year now. It can be a struggle at times when non-vegans come to visit, but largely it works out good. No one has ever starved at our table ;)’ Thanks!